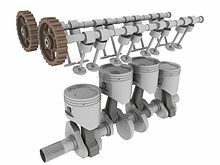 The inline-four engine or straight-four engine is a type of inline internal combustion four-cylinder engine with all four cylinders mounted in a straight line, or plane along the crankcase. The single bank of cylinders may be oriented in either a vertical or an inclined plane with all the pistons driving a common crankshaft. Where it is inclined, it is sometimes called a slant-four. In a specification chart or when an abbreviation is used, an inline-four engine is listed either as I4 or L4 (for longitudinal, to avoid confusion between the digit 1 and the letter I). The inline-four layout is in perfect primary balance and confers a degree of mechanical simplicity which makes it popular for economy cars. However, despite its simplicity, it suffers from a secondary imbalance which causes minor vibrations in smaller engines. These vibrations become more powerful as engine size and power increase, so the more powerful engines used in larger cars generally are more complex designs with more than four cylinders. Today almost all manufacturers of four-cylinder engines for automobiles produce the inline-four layout, with Subaru and Porsche 718 flat-four engines being notable exceptions, and so four-cylinder is usually synonymous with and a more widely used term than inline-four. The inline-four is the most common engine configuration in modern cars, while the V6 engine is the second most popular. In the late 2000s (decade), due to stringent government regulations mandating reduced vehicle emissions and increased fuel efficiency, the proportion of new vehicles sold in the U.S. with four-cylinder engines (largely of the inline-four type) rose from 30 percent to 47 percent between 2005 and 2008, particularly in mid-size vehicles where a decreasing number of buyers have chosen the V6 performance option. This configuration is most commonly used for petrol engine displacements up to 3.0 L. Porsche, for instance, used a 3.0 L four in its 944 S2 and 968 sports cars. Production cars with inline-fours larger than 3.0 L have included the 1927 Model A Ford (3.3 L (201 cu in)), the 1965-1980 International Harvester Scout (3.2 L (195 cu in)), the 1961-1963 Pontiac Tempest (3.2 L (195 cu in) Pontiac inline-4 engine) and, in smaller quantities, the 1927-1931 Bentley 4½ Litre. A few very early vehicles had inline-four engines with much larger displacements, including the 1910 Blitzen Benz (21.5 L (1,312 cu in)) and the 1911 Fiat S76 Record (28.4 L (1,733 cu in)). Inline-four diesel engines, which are lower revving than gasoline engines, often exceed 3.0 L. Mitsubishi still employs a 3.2 L inline-four turbodiesel in its Pajero (called the Shogun or Montero in certain markets), and several manufacturers of light commercial vehicles and large four-wheel drive vehicles, such as Fiat Powertrain Technologies, Isuzu, Nissan, Tata Motors, and Toyota employ a 3.0 L inline-four diesel. Larger inline-four engines are used in industrial applications, such as in small trucks and tractors, are often found with displacements up to about 5 L. Diesel engines for stationary, marine and locomotive use (which run at low speeds) are made in much larger sizes. Generally, European and Asian manufacturers of trucks with a gross vehicle weight rating between 7.5 and 18 tonnes use inline four-cylinder diesel engines with displacements around 5 L. The MAN D0834 engine is a 4.6 L inline-4 with 220 hp (164 kW) and 627 lb⋅ft (850 N⋅m), which is available for the MAN TGL light-duty truck and VARIOmobil motorhomes. The Isuzu Forward is a medium-duty truck which is available with a 5.2 L inline-four engine that delivers 210 hp (157 kW) and 470 lb⋅ft (640 N⋅m). The Hino Ranger is a medium-duty truck which is available with a 5.1 L inline-four engine that delivers 175 hp (130 kW) and 465 lb⋅ft (630 N⋅m). The earlier Hino Ranger even had a 5.3 L inline-four engine. The Kubota M135X is a tractor with a 6.1 L inline-four. This turbo-diesel engine has a bore of 118 mm (4.6 in) and a relatively long stroke of 140 mm (5.5 in). One of the strongest Powerboat-4-cylinders is the Volvo Penta D4-300 turbodiesel. This is a 3.7 L-inline-4 with 300 hp (224 kW) and 516 lb⋅ft (700 N⋅m). Brunswick Marine built a 127 kW (170 bhp) 3.7 L 4-cylinder gasoline engine (designated as the "470") for their Mercruiser Inboard/outboard line. The block was formed from one half of a Ford 460 cubic inch V8 engine. This engine was produced in the 1970s and 1980s. One of the largest inline-four engines is the MAN B&W 4K90 marine engine. This two-stroke turbo-diesel has a giant displacement of 6,489 L. This results from a massive 0.9 meter bore and 2.5 meter stroke. The 4K90 engine develops 18,280 kW (24,854 PS; 24,514 hp) at 94 rpm and weighs 787 tons. The largest on-road inline-4 cylinder turbo-diesel engine is the Detroit Diesel Series 50, with a displacement of 8.5 L. It is widely used in various applications such as buses, trucks, and more. Power ratings varied from 250 hp to 350 hp. It was manufactured from 1994, until 2005. The Series 50 was also marketed as the Series 50G, for its CNG and LNG versions. 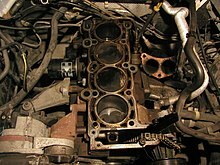 Displacement can also be very small, as found in kei cars sold in Japan, such as the Subaru EN series; engines that started out at 550 cc and are currently at 660 cc, with variable valve timing, DOHC and superchargers resulting in engines that often claim the legal maximum of 64 PS (47 kW; 63 bhp). The 1.2 L, turbocharged, direct-injected, Toyota 8NR-FTS engine has a maximum power output of 114 hp (85 kW) and a maximum torque of 190 Nm (140 lbft) at a low rpm (1500 rpm). The inline-four engine is much smoother than one- or two-cylinder engines, and this has resulted in it becoming the engine of choice for most economy cars for many years. Its prominent advantage is the lack of rocking vibration, and the lack of need for heavy counterweights makes it easier to be sporty (quick revving up and down). However, it tends to show secondary imbalance at high rpm because two pistons always move together, making the imbalance twice as strong as other configurations without them. An even-firing inline-four engine is in primary balance because the pistons are moving in pairs, and one pair of pistons is always moving up at the same time as the other pair is moving down. However, piston acceleration and deceleration is greater in the top half of the crankshaft rotation than in the bottom half, because the connecting rods are not infinitely long, resulting in a non-sinusoidal motion. As a result, two pistons are always accelerating faster in one direction, while the other two are accelerating more slowly in the other direction, which leads to a secondary dynamic imbalance that causes an up-and-down vibration at twice crankshaft speed. This imbalance is common among all piston engines, but the effect is particularly strong on inline-four because of the two pistons always moving together. The reason for the piston's higher speed during the 180° rotation from mid-stroke through top-dead-centre, and back to mid-stroke, is that the minor contribution to the piston's up/down movement from the connecting rod's change of angle here has the same direction as the major contribution to the piston's up/down movement from the up/down movement of the crank pin. By contrast, during the 180° rotation from mid-stroke through bottom-dead-centre and back to mid-stroke, the minor contribution to the piston's up/down movement from the connecting rod's change of angle has the opposite direction of the major contribution to the piston's up/down movement from the up/down movement of the crank pin. The strength of this imbalance is determined by 1. Reciprocating mass, 2. Ratio of connecting rod length to stroke, and 3. Acceleration of piston movement. So small displacement engines with light pistons show little effect, and racing engines use long connecting rods. However, the effect grows exponentially with crankshaft rotational speed. See crossplane article for unusual inline-four configurations. Most inline-four engines below 2.0 L in displacement rely on the damping effect of their engine mounts to reduce the vibrations to acceptable levels. Above 2.0 L, most modern inline-four engines now use balance shafts to eliminate the secondary vibrations. In a system invented by Dr. Frederick W. Lanchester in 1911, an inline-four engine uses two balance shafts, rotating in opposite directions at twice the crankshaft's speed, to offset the differences in piston speed. In the 1970s, Mitsubishi Motors patented these balancer shafts to be located at different heights to further counter the rotational vibration created by the left and right swinging motion of connecting rods. [note 1] Porsche, Fiat, Saab, and Chrysler were among the companies who licensed this technology from Mitsubishi. 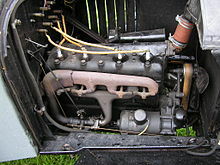 However, in the past, there were numerous examples of larger inline-fours without balance shafts, such as the Citroën DS 23 2,347 cc engine that was a derivative of the Traction Avant engine, the 1948 Austin 2,660 cc engine used in the Austin-Healey 100 and Austin Atlantic, the 3.3 L flathead engine used in the Ford Model A (1927), and the 2.5 L GM Iron Duke engine used in a number of American cars and trucks. Soviet/Russian GAZ Volga cars and UAZ SUVs, vans and light trucks used aluminium big-bore inline-four engines (2.5 or later 2.9 L) with no balance shafts from the 1950s-1990s. These engines were generally the result of a long incremental evolution process and their power was kept low compared to their capacity. However, the forces increase with the square of the engine speed — that is, doubling the speed makes the vibration four times more forceful — so some modern high-speed inline-fours, generally those with a displacement greater than 2.0 litres, have more need to use balance shafts to offset the vibration. Four-cylinder engines also have a smoothness problem in that the power strokes of the pistons do not overlap. With four cylinders and four strokes to complete in the four-stroke cycle, each piston completes its power stroke before the next piston starts a new power stroke, resulting in a pause between each power stroke and a pulsating delivery of power. In engines with more cylinders, the power strokes overlap, which gives them a smoother delivery of power and less torsional vibration than a four can achieve. As a result, five-, six-, eight-, ten- and twelve-cylinder engines are generally used in more luxurious and expensive cars. 4-cylinder engines, often derided as "four bangers" do offer some advantages; an alloy block inline four is usually small, compact and lightweight, which serves to decrease overall vehicle mass, usually resulting in an increase in fuel efficiency in the urban cycle. The light weight of the inline four also allows for ease of removal and installation when maintenance or overhaul become necessary. When compared to a V6 or V8, an inline four will generally have somewhat lower frictional losses at a comparable engine speed due to having fewer pistons, connecting rods and bearings, although the lower frictional loss is offset in practice by the inline four's need to operate at a higher RPM compared to a larger engine in order to produce equivalent power. In a diesel powered engine, this is less of a problem, hence why certain inline 4 engines can be scaled up to 5 litres in commercial vehicle use such as a bus or small lorry. A major advantage of an inline 4 engine is that as most internal combustion engines use the 4 stroke "Otto" cycle, that means with a 4-cylinder engine one cylinder will always be on the power stroke, a major advantage over a 1, 2, or 3 cylinder engine when no power stroke occurs at certain times. 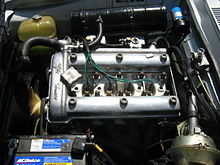 A straight 4 only has one cylinder head, a major advantage over servicing and maintenance compared to Vee angled engine such as a V6 which has 2 cylinder heads - and consequently an inline 4 had less probability of reliability issues as there is less frictional losses which can cause problems such as overheating and head gasket problems (see above). A V6 engine has poor primary and secondary balance, and requires extensive use of balance shafts and harmonic damping which ultimately sap ultimate engine power, whereas an inline 4 cylinder engine only requires a small balance shaft to eliminate the secondary imbalance. A notable inline 4 engine would be the BMW Megatron M12 1.5-litre Formula 1 straight-4 engine, which won the 1983 World Drivers Championship installed in the Brabham BT52 chassis driven by Nelson Piquet. In the second half of the 1983 Formula 1 season, the BMW was capable of over 800 BHP in qualifying, while in race trim usually had an output of between 640 BHP to 700 BHP depending on how much boost the drivers used. The smallest automobile production inline-four engine powered the 1962-1970 Mazda P360 Carol kei car. Displacing just 358 cc, the Mazda DA was a conventional but tiny pushrod engine. Honda produced, from 1963 to 1967, a 356 cc (21.7 cu in) inline-four engine for the T360 truck. Inline-four motorcycle engines are built down to 250 cc, e.g. in the Honda CBR250. Most inline-four engines, however, have been over 700 cc (43 cu in) displacement. A practical upper limit could be placed in the 2.5 L range for contemporary production cars. Larger engines (up to 6.1 L) have been seen in tractors (Kubota M135X) and medium duty truck use (Isuzu Forward, Hino Ranger), especially using diesel fuel (one of the strongest is the MAN D0834 engine with 220 hp (164 kW) and 627 lb⋅ft (850 N⋅m)). The use of balance shafts allowed Porsche to use a 3.0 L (2,990 cc) inline-four engine on road cars first in the 944 S2, but the largest modern non-diesel was the 3,186 cc (194.4 cu in) Pontiac inline-4 produced from one half of the Division's 6,373 cc (388.9 cu in) V8 for the debut of its 1961 Tempest. The largest mass-produced inline-four engine in a car has currently the Mitsubishi Pajero 3.2 DI-D, which has a 3,200 cc inline-four with 165 hp (123 kW) at 3,500 rpm (in Europe, 200 hp) and 381 N⋅m (281 lb⋅ft) at 2,000 rpm. The Engine has a bore of 98.5 mm (3.9 in) and a stroke of 105 mm (4.1 in). Currently, one of the largest straight-4 engines in production is General Motors' Vortec 2900 installed in the GMC Canyon and Chevrolet Colorado small pickup trucks. It shares the same 95.5 mm (3.8 in) bore and 102 mm (4.0 in) stroke as the larger inline-five Vortec 3700. The latest version of the Vortec 2900, the LLV, displaces 2.9 L (2921 cc, 178 in³) and produces 185 hp (138 kW) at 5,600 rpm and 195 lb⋅ft (264 N⋅m) at 2,800 rpm. Engine redline is 6,300 rpm. Another example of a large inline-four engine is the Russian 2.89 L UMZ 421 series UMZ engine. In the early 20th century, bigger engines existed, both in road cars and sports cars. Due to the absence of displacement limit regulations, manufacturers took increasing liberties with engine size. In order to achieve power over 100 hp (75 kW), most engine builders simply increased displacement, which could sometimes achieve over 10.0 L. The biggest inline-four ever made was the 28.3 L engine used in the 1911 Fiat S76 racing car. These engines ran at very low rpm, often less than 1,500 rpm maximum, and had a specific output of about 10 hp/L. The US tractor industry both farm and industrial relied on large four-cylinder power units until the early 1960s, when six-cylinder designs came into favour. International Harvester built a large 5.7-litre (350 CID) four-cylinder for their WD-9 series tractors. Alfa Romeo Twin Cam engine - one of the first mass-produced twin cam engines produced from 1954. Also first engine in production car with variable valve timing. BMC A-Series engine - the first engine to be used in a transverse drive train powering the front wheels of a mass-produced automobile (Mini). Chevrolet Cosworth Twin-Cam Vega - 2.0 L all aluminum (block & head), DOHC, 16 valves, electronic fuel injection, stainless steel header. Dodge A853 - intercooled turbo engine from the SRT-4, set the land speed record for 4-cylinder production cars at the Bonneville Salt Flats. Fiat Twin Cam engine - One of the first mass-produced twincam engines, produced from 1959. Ford Model T engine - one of the most widely produced engines in the world. GM Quad-4 engine - twin-cam Oldsmobile engine offered in GM small, sporty cars. Honda ED engine - first use of Honda's CVCC technology. Honda F20C engine - its 250 PS (180 kW; 250 hp) from 2.0 L was the highest specific output of its time, particularly noteworthy in that it achieved this without forced induction. Triumph Slant-4 engine - the first mass-produced multi-valve engine for Triumph and an early turbo engine for Saab. Willys L-134 engine - nicknamed the Go Devil engine. Powered the World War II Jeep and post-war models. Notably undersquare, with 3.125 in (79.4 mm) bore and 4.375 in (111.1 mm) stroke. In the late 2000s (decade), with auto manufacturers making efforts to increase fuel efficiency and reduce emissions, due to the high price of oil and the economic recession, the proportion of new vehicles with inline-four engines have increased considerably at the expense of V6 and V8 engines. This is particularly evident in mid-size vehicles where a decreasing number of buyers have chosen the V6 performance options. 1913 saw a Peugeot driven by Jules Goux winning the Indianapolis 500. This car was powered by an inline-four engine designed by Ernest Henry. This design was very influential for racing engines as it had, for the first time, dual overhead camshafts (DOHC) and four valves per cylinder, a layout that would become the standard until today for racing inline-four engines. This Peugeot was sold to the American driver "Wild Bob" Burman who broke the engine in 1915. As Peugeot couldn't deliver a new engine during World War I, Burman asked Harry Arminius Miller to build a new engine. With John Edward and Fred Offenhauser, Miller created a Peugeot-inspired inline-four engine. This was the first version of the engine that would dominate the Indianapolis 500 until 1976 under the brand Miller and later Offenhauser. The Offenhausers won five straight victories at Indianapolis from 1971 to 1976, and it was not until 1981 that they were eliminated as competitors by engines such as the Cosworth V8 engine. Many cars produced for the pre-WWII voiturette Grand Prix motor racing category used inline-four engine designs. 1.5 L supercharged engines found their way into cars such as the Maserati 4CL and various English Racing Automobiles (ERA) models. These were resurrected after the war, and formed the foundation of what was later to become Formula One, although the straight-eight supercharged Alfettas would dominate the early years of F1. Another engine that played an important role in racing history is the inline-four Ferrari engine designed by Aurelio Lampredi. This engine was originally designed as a 2 L Formula 2 engine for the Ferrari 500, but evolved to 2.5 L to compete in Formula One in the Ferrari 625. For sports car racing, capacity was increased up to 3.4 L for the Ferrari 860 Monza. Yet another very successful engine was the Coventry Climax inline-four originally designed by Walter Hassan as a 1.5 L Formula 2 engine. Enlarged to 2.0 L for Formula One in 1958, it evolved into the large 2,495 cc FPF that won the Formula One championship in Cooper's chassis in 1959 and 1960. In formula One, the 1980s were dominated by the 1,500 cc turbocharged cars. The BMW model M12/13 turbo was notable for the era for its high boost pressures and performance. The cast iron block 4-cylinder turbocharged Formula One motor, based on the standard BMW M10 engine introduced in 1961, powered the F1 cars of Brabham, Arrows and Benetton and won the world championship in 1983. In the years 1986 and 1987, the version M12/13/1 was tilted sideways by 72° for use in the extremely low Brabham BT55. Unfortunately the design was not successful, probably due to cooling issues in the tight compartment. The 1986 engine was said to produce about 1,300 hp (969 kW) in qualifying. Belgian arms manufacturer FN Herstal, which had been making motorcycles since 1901, began producing the first motorcycles with inline-fours in 1905. The FN Four had its engine mounted upright with the crankshaft longitudinal. Other manufacturers that used this layout included Pierce, Henderson, Ace, Cleveland, and Indian in the United States, Nimbus in Denmark, Windhoff in Germany, and Wilkinson in the United Kingdom. The first across-the-frame 4-cylinder motorcycle was the 1939 racer Gilera 500 Rondine, it also had double-over-head camshafts, forced-inducting supercharger and was liquid-cooled. Modern inline-four motorcycle engines first became popular with Honda's SOHC CB750 introduced in 1969, and others followed in the 1970s. Since then, the inline-four has become one of the most common engine configurations in street bikes. Outside of the cruiser category, the inline-four is the most common configuration because of its relatively high performance-to-cost ratio. All major Japanese motorcycle manufacturers offer motorcycles with inline-four engines, as do MV Agusta and BMW. BMW's earlier inline-four motorcycles were mounted horizontally along the frame, but all current four-cylinder BMW motorcycles have transverse engines. The modern Triumph company has offered inline-four-powered motorcycles, though they were discontinued in favour of triples. The 2009 Yamaha R1 has an inline-four engine that does not fire at even intervals of 180°. Instead, it uses a crossplane crankshaft that prevents the pistons from simultaneously reaching top dead centre. This results in better secondary balance, which is particularly beneficial in the higher rpm range, and "big-bang firing order" theory says the irregular delivery of torque to the rear tire makes sliding in the corners at racing speeds easier to control. ^ When a connecting rod swings left on the top half of crank rotation, another swings right on the bottom half, with the connecting rod center of gravity (CG) heights located as much as the piston stroke apart. When the CG is located at different heights, the swing motion to the left cannot cancel the swing motion to the right, and a rocking vibration is introduced. By placing the balancer shafts at different heights, this vibration can be cancelled in addition to the cancellation of the secondary vibration. ^ "Performance: The new 718 Boxster". Porsche. 2016. Retrieved 2016-11-01. ^ Schembari, James (2010-10-15). "A Family Sedan Firing on Fewer Cylinders - 2010 Buick LaCrosse CX - Review". The New York Times. ^ Ulrich, Lawrence (2010-08-13). "Four-Cylinder Engines Are Smaller, Quieter and Gaining New Respect". The New York Times. ^ "MAN Truck & Bus - TGL". Archived from the original on 2011-05-23. Retrieved 2011-05-09. ^ "VARIOmobil - Welcome to a lap of luxury coaches - recreation vehicles - motor homes". Archived from the original on 2011-08-27. Retrieved 2011-05-09. ^ "Isuzu Commercial Vehicles - Low Cab Forward Trucks - Commercial Vehicles - 4HK1-TC 5.2L Diesel Engine". Archived from the original on 2010-12-24. Retrieved 2010-12-14. ^ "Diesel Engines | Products". Hino Global. Retrieved 2017-05-23. ^ Stevenson, Terry (2010-08-23). "Kubota M135X tractor". Farmtrader.co.nz. Retrieved 2017-05-23. ^ "On land and at sea". Volvo Penta. Retrieved 2017-05-23. ^ "A comprehensive A-Z listing of marine diesel engines in excess of 300kW" (PDF). Masson-marine.com. Retrieved 2011-11-13. ^ Carney, Dan (2014-06-10). "Before they were carmakers". UK: BBC. Retrieved 2018-11-01. ^ Nadel, Brian (June 1989). "Balancing Act". Popular Science. p. 52. ^ "D0834_LKW_dt.indd" (PDF). Archived from the original (PDF) on 2011-07-14. Retrieved 2011-08-01. ^ "MITSUBISHI MOTORS in Deutschland". Mitsubishi-motors.de. 2016-08-16. Archived from the original on 2013-06-06. Retrieved 2017-05-23. ^ "Goodwood - Video: 28.5-litre Fiat S76 at FoS". Grrc.goodwood.com. Retrieved 2017-05-23. ^ "Fiat S76 (#1) 28.3 liter 1911". flickr.com. Retrieved 2012-10-22. ^ Ludvigsen, pp. 78-81, 86-89. ^ "BMW Turbo F1 Engine". Gurneyflap.com. Retrieved 2010-09-13. ^ Siegal, Margie (May–June 2017). "The Same, But Different: 1927 Cleveland 4-45 and 4-61 Motorcycles". Motorcycle Classics. Retrieved 2017-06-20. ^ Edwards, David (August 1997). Edwards, David, ed. "Four-Runners". Cycle World. Newport Beach, CA USA: Hachette Filipacchi Magazines. 36 (8): 42–43. ISSN 0011-4286. Retrieved 2013-09-21. ^ Hamish, Cooper (January–February 2018). "Radical Rondine: 1939 Gilera 500 Rondine". Motorcycle Classics. Retrieved 2018-04-13. Ludvigsen, Karl (2001). Classic Racing Engines. Haynes Publishing. ISBN 1-85960-649-0.